Design Thinking is for everyone, in any role. Join this two-day workshop for an opportunity to learn this philosophy of design and to develop your tools for user-focused empathy, creativity, and innovation. 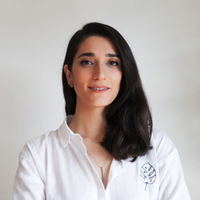 Merve Postalcıoğlu, a Toptal designer, leads this workshop. October 4-5, 10:00am to 6:00pm, participants will learn five steps of Design Thinking and will apply them to a real-world challenge. Get hands-on training in methods and tools to analyze user needs, generate ideas, and prototype designs.